*this post was originally published on Dec 27, 2013. It has been updated and republished. As promised, I have for you today another free tutorial – how to make chain earrings from paper quilling! This is a very basic design idea, but has such fabulous and elegant results! Depending on the colors, size, and other variations you choose you can use these earrings with your casual, office, or even evening wear! First of all, when making paper chain earrings the technique I use is to make open circles. This means that I roll the paper around something wide, not around the tip of a quilling tool as usual. For my usual beads, I use the end of my aluminum quilling tool (find it on Amazon) to roll the paper around. For most of my paper beads I use quilling paper that is 1/8″ (3mm) wide. You can use quilling paper that is specially cut, or you can cut your own. 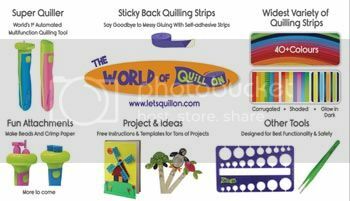 (Click here to learn how to cut your own strips) You can use any width of paper that you prefer. If you use wider paper you will need to use larger jump rings. Take your strip of paper and wrap the end around the end of your aluminum tool (or any other object you are using instead. The diameter of the end of my tool is 3/16″ or 4.5mm). Place a tiny tab of glue at the end of your paper. The next step is to add sealer to your beads so that they are more sturdy and they are water resistant. This is not necessary if you are just making the earrings for yourself and you don’t mind re-making them once in awhile if something happens to them. But if you’d like them to be long lasting, definitely add a sealer to them. You can use any sealer or top coat you find in a craft store (click here to read all my posts about sealants and topcoats). I have tried a few brands and all seem to work well. For these beads I usually use a more liquid sealer (like Ceramcoat liquid sealer ) and I dip the beads, let them sit in the sealant for a few seconds, pick them up with tweezers, dab them on a tissue, and set them on a plastic surface to dry completely. Depending on the sealer I use I may just need one coat or I may need to use several coats. Click here for my full review and tips for Ceramcoat sealer. For extra water resistant protection, use something like Diamond Glaze as the final layer (after the sealer has dried). Click here for my full review and tips for Diamond Glaze. When your beads are dry and sealed, it’s time to put them together! I find that for paper that is 1/8″ in width that I use for these beads I use jump rings that are 6mm. You can also use 7mm. I find that 5mm is just a little too squishy for this size. But if you use narrow width paper you can get away with using 5mm jump rings. You could even make these beads with 1/4″ wide paper if you use big enough jump rings! That would be a pretty cool look! Here are some photos of earrings that I have made with the basic paper bead made with 6″ long paper on the end of the aluminum tool. I like the rainbow ones because they are so fun and fresh, a perfect look for summer! But my very favorite are the ones made from the metallic papers. They really don’t look like they are made from paper! The longer ones that I made and looped around are very elegant looking. Yet another variation is to make a different sized bead. I like the look of these larger beads for a fun change! For these I use a different tool instead of the end of my aluminum quilling tool. I use the end of a pen that I have that has a nice smooth barrel. You can use any object really, just experiment! For a larger object you will need a longer piece of paper. Try 9″ or 12″ and see what you like. The longer the paper is the thicker and stronger the bead will be. Of course if they are much thicker you will need a bigger jump ring size, so just experiment and find a combo that works well for the materials you have on hand. I hope you have enjoyed learning how to make chain earrings from paper quilled beads! I really love the simplicity and elegance of these earrings! Looking for more tutorials and patterns? Find some free ones here, and find some longer and more detailed ones here for sale in my Etsy shop! Click HERE to view tips and tricks for paper quilling, divided into subjects! *All products in this post I purchased and/or made myself. Your works are very beautiful. All different shapes of earings are very royal. I want to know where do i get adhersive. I dont use this. The information on type of glue is very useful to me. I am from India, city pune. 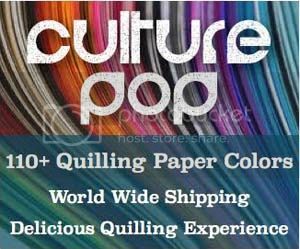 I want to sell my paper-quilled few products. So please advice how to proceed. Appreciated For your help. Do have any references .. website/contact number so I can sell/sample paper-quilled few products with the reference . nicely explained.I like u r writings.I love your earring designs,all are unique. Thank you for sharing.I learned a lot from your site. I am in USA. from which shop can I buy jump rings or any jewelry making accessories? You can get jewelry findings almost anywhere. Even in Walmart in the craft section! Any other craft store like Michael’s will also carry them. If you prefer to order online you can just google search for “jewelry findings” and there are many online stores that carry a wide selection. There are many little stores on Etsy which carry a good selection as well and are based in the US. Love this as a jewellery maker these would be fab on my stall. Would I be ok to make and sell these. Yes, feel free, have fun!! I was wondering what you used to seal the paper so they can be worn. I am in the USA and am just starting to quill. I need a specific color and have the paper but am worried about the paper color running. Thanks in advance.